Fourteen people have perished in a road accident this morning. 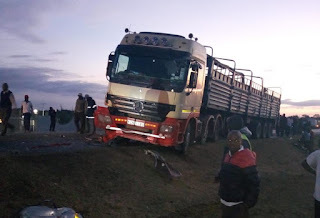 The accident occurred at around 5am along Thika - Garissa Highway in Matuu, Machakos County where a bus belonging to Medina Company rammed into a stalled lorry. Yatta police commander, Joseph Karanja confirming on the accident said the bus belonging to Medina Company was headed for Nairobi from Mandera. The bus coming from Mandera heading to Nairobi rammed into a stalled lorry by the roadside. Sadly due to the impact, fourteen lives were lost. Those injured were taken to Matuu Level 4 Hospital and are receiving treatment. Drivers should be more cautious and more so those travelling at night to avoid causing accidents.